Objective : To evaluate the apical sealing ability and adaptation of three resin-based sealers to the dentine. Materials and Methods : A total of 66 recently extracted human maxillary anterior teeth were subjected for the study. The teeth were prepared and obturated with gutta-percha by a lateral condensation using AH Plus, Endorez and Epiphany sealers. Fifteen teeth from each group were used for the apical leakage test and the remaining five teeth from each group were used for examination under the scanning electron microscope. Data were analyzed using one-way ANOVA and the Student Newman-Keuls test. Results : Epiphany sealer showed better sealing ability and adaptation to dentine. Conclusion : The Epiphany sealer has a better apical sealing ability and adaptation to dentine than the AH Plus and Endorez sealers. The purpose of this in vitro study was to compare the apical sealing ability and adaptation of three resin-based sealers to dentine. A total of 66 recently extracted intact, non-carious, non-restored human maxillary anterior teeth that were free from malformed roots, calcified root canals, open apices and had straight roots were subjected for the study. All 66 teeth were cleaned to remove surface calculus and stains. The teeth were placed in 5.25% NaOCl (Vensons, Bangalore, India) solution for 8 h to remove the surface soft tissues and debris, then washed with tap water and, subsequently, stored in saline solution until they were used. The crowns of the teeth were sectioned at the cemento-enamel junction using a water-cooled diamond disc. Routine access openings were prepared and then the working lengths were visually determined by subtracting 1 mm from the length of a size 10 K-file (Dentsply, OK, USA) at the apical foramen. All the canals were instrumented to the working length with a size 50 K-file (Dentsply) using the step-back technique. The middle and coronal thirds were prepared using size 2-4 Gates Glidden drills (Mani Inc., Tochigi, Japan) with a low-speed hand piece. The root canals were irrigated with 1 ml of 5.25% NaOCl (Vensons) after each file while instrumenting the canals. The patency of the apical foramen were confirmed with a size 10-15 K-files (Dentsply). Following the root canal preparation, in order to remove the smear layer, the canals were irrigated with 10 ml of 17% ethylenediaminetetraacetic acid (EDTA) (Septodont, Cedex, France) for 1 min and 10 ml of 5.25% NaOCl (Vensons). A syringe with a 23-gauge needle was used for irrigation. Finally, the root canals were flushed with 3 ml of distilled water and then dried with paper points. The teeth were randomly divided into three groups of 20 teeth each and the remaining six teeth served as a dye leakage control. Group 1: Gutta-percha with AH Plus sealer. Group 2: Gutta-percha with Endorez sealer. Group 3: Gutta-percha with Epiphany sealer. Group 4: Positive control of gutta-percha with AH Plus sealer. Group 5: Positive control of gutta-percha with Endorez sealer. Group 6: Positive control of gutta-percha with Epiphany sealer. Group 7: Negative control of gutta-percha with AH Plus sealer. Group 8: Negative control of gutta-percha with Endorez sealer. Group 9: Negative control of gutta-percha with Epiphany sealer. Each sealer was prepared according to the manufacturer's instructions and the canal walls were slightly coated with a sealer using a size 45 K-file (Dentsply) with a counter-clockwise motion. The apical part of the master gutta-percha cone was coated with the mixed sealer and placed in the canal. The canals were filled with accessory cones by the lateral condensation technique. The access openings were closed with Cavit and all specimens were kept in 100% humidity at 370C for 72 h to allow the sealers to set. Fifteen teeth from each group were used for the apical leakage test and five teeth were reserved for examination with a scanning electron microscope (SEM). Three teeth, which served as negative controls, were filled with sealers and gutta-percha points. Three teeth, which served as positive controls, were left unfilled. Apical leakage was estimated by a dye penetration test. The root surfaces of all specimens were coated with two layers of nail varnish and sticky wax with the exception of the apical 1 mm, but the root surfaces of the negative control teeth were entirely coated with two layers of nail varnish and sticky wax to prevent possible leakage. The specimens were then immersed in 2% methylene blue solution for 7 days at 370C. After being removed from the dye solution, the specimens were washed with tap water and dried and then the nail varnish and sticky wax were removed with a scalpel. The root of each tooth was grooved longitudinally in the bucco-lingual direction using a low-speed diamond disc under constant cooling with distilled water, without disturbing the gutta-percha filling and then the root was longitudinally sectioned. Maximum dye penetration was measured in millimeters in each half of each tooth from the apex to the most coronal part of the root canal to which the dye had penetrated using a stereomicroscope. Reserved five specimens from each group were prepared for SEM examination. The roots were grooved longitudinally as it was mentioned above. They were then split into two halves by placing a cement spatula in the grooves and applying gentle pressure. Both fractured halves of each root were mounted on aluminum stubs, vacuum-dried, coated with 20 nm of gold and then examined under SEM. The penetration of sealers into dentinal tubules and adaptation to dentinal walls were examined from the apical to the coronal and microphotographs were taken at 1500Χ magnification. The results were statistically analyzed using one-way ANOVA and the multiple comparisons among the groups was carried out by the Student Newman-Keuls test. The level of significance was fixed at P <0.05. The positive control teeth showed complete leakage throughout the length of the root canal, whereas the negative control teeth revealed no dye penetration. Dye penetration in the experimental groups occurred mainly at the interface of the sealer and the root canal wall in the majority of the specimens. [Table 1] shows the mean microleakage (mm), SD and SE for each study groups. The mean value of dye penetration for the AH Plus root canal sealer was 6.9 ± 0.62 mm, Endorez sealer was 9.36 ± 0.86 mm and Epiphany sealer was 3.85 ± 0.89 mm. [Table 2] shows the multiple comparison of mean leakage and SD of each study groups. Multiple paired comparisons (Student Newman-Keuls Test) showed that group 3 (GP and Epiphany) had the least amount of microleakage than all the other groups; group 1 (GP and AH Plus) proved to have the second-least amount of microleakage among the groups. Group 2 (GP and Endorez) demonstrated the greatest amount of microleakage. There was a significant difference between group 3 (GP and Epiphany) and group 2 (GP and AH Plus) (P < 0.05). The SEM study was carried out for dentine adaptability. SEM examination showed better dentine adaptability for group 3 (GP and Epiphany) than group 1 (GP and AH Plus) and group 2 (GP and Endorez). Ideally, the root canal sealer should be capable of producing a bond between the cone material and the root dentine effectively preventing leakage. Three-dimensional sealing of the root canal is one of the main goals of endodontic treatment and is essential for preventing reinfection of the canal and for preserving the health of the periapical tissues, thereby ensuring the success of root canal treatment. Thus, several types of endodontic sealers have been recommended to achieve this goal and, consequently, the evaluation of the apical sealing ability of the sealers is important. It is important to point out that not only is the apical seal of the root canal but the coronal seal is of equal importance for the success of endodontic treatment. In this study, apical sealing and adaptation of three resin-based sealers to dentine was assessed. Ideally, further directions should focus on materials that penetrate the patent dentinal tubules, bind intimately to both organic and inorganic phases of dentin, neutralize or destroy microorganisms and their products, predictably induce a cemental regenerative response and strengthen the root system. Results of this study showed that group 3 (GP and Epiphany) showed less microleakage than group 1 (GP and AH Plus) and group 2 (GP and Endorez). There was a statistically significant difference when the three groups were compared. Group 1 (GP and AH Plus) showed less microleakage than group 2 (GP and Endorez). These results are in agreement with the following studies. The scanning electron microscopy showed that Epiphany had adapted better to dentine and penetrated more into dentinal tubules than the AH Plus and Endorez root canal sealers from apical to coronal of root canal. All the sealers showed poorer adaptation and penetration in the apical third than the coronal and middle thirds of the root canal. This difference may be due to the removal efficiency of the smear layer in the apical third of the canal. In addition, the number and size of the dentinal tubules and the structure of the dentine (tubule density) in the apical third and the employed obturation techniques may affect the adaptation and penetration of sealers. According to results of this study, the dual curable methacrylated resin with a self-etching primer Epiphany had better apical sealing ability and better adaptability to dentine than epoxy-based AH Plus sealer and methacrylate-based Endorez sealer. But, further studies using different sealers and techniques are warranted before Epiphany can be recommended for clinical application. 1. West JD, Roane JB. Cleaning and shaping the root canal system. In: Cohen S, Burns RC, editors. Pathways of the pulp chapter-8. 7th ed. St.louis: Mosby Inc; 1998. p. 203-357. 2. Swartz DB, Skidmore AE, Griffin JA. Twenty years of endodontic success and failure. J Endod 1980;9:198-202. 3. Matsumoto T, Nagai T, Ida K, Ito M, Kawai Y, Horiba N, et al. Factors affecting successful prognosis of root canal treatment. J Endod 1987;13:239-42. 4. Sjogren U, Hagglund B, Sundqvist G, Wing K. Factors affecting the long -term results of endodontic treatment. J Endod 1990;16:498-504. 5. Nguyen TN. Obturation of the root canal system. In: Cohen S, Burns RC,Gutmann JL. Adaptation of injected thermoplasticized gutta-percha in the absence of the dentinal smear layer. Int Endod J 1993;26:87-92. 6. Itoh A, Higuchi N, Minami G, Yasue T, Yoshida T, Maseki T, et al. A survey of filling methods, intracanal medications and instrument breakage. J Endod 1999;25:823-4. 7. Ahlberg KM, Tay WM. A methacrylate-based cement used as a root canal sealer. Int Endod J 1998;31:15-21. 8. Orstavik D, Kereker K, Eriksen HM. Clinical performance of three endodontic sealers. Int Endod J 1981:14:27-34. 9. De Almeida WA, Leonardo MR, Tanomaru Filho M, Silva LA. Evaluation of apical sealing of three endodontic sealers. Int Endod J 2000;33:25-7. 10. Benatti O, Stolf WL, Ruhnke LA. Verification of the consistency, setting time and dimensional changes of root canal filling materials. Oral Surg Oral Med Oral Pathol 1978;46:107-13. 11. Aboush Y, Jenkins CB. An evaluation of the bonding of glass ionomer restorative to dentin and enamel. Br Dent J 1986;16:179-84. 12. Limkangwalmongkol S, Abbott PV, Sandler AB. Apical dye penetration with four root canal sealers and gutta-percha using longitudinal sectioning. J Endod 1992;18:535-9. 13. L eyhausen G, Heil J, Reifferscheid G, W aldmann P, Geurtsen W. Genotoxicity and cytotoxicity of the epoxy resin-based root canal sealer AH Plus. J Endod 1999;25:109-13. 14. Leonardo MR, Silva LA, Almeida WA, Utrilla LS. Tissue response to an epoxy resin - based root canal sealer. Endod Dent Traumatol 1999;15:28. 15. Al-khatar N, Kunzelmann K, Hickel R. Apical leakage of new root canal sealers. J Dent Res 1995;74:945. 18. Sevimay S, Kalayci A. Evaluation of apical sealing ability and adaptation to dentine of two resin-based sealers. J Oral Rehabil 2005;32:105-10. 19. Tunga U, Bodrumlu E. Assessment of the sealing ability of a new root canal obturation material. J Endod 2006;32:876-8. 20. Versiani MA, Carvalho-Junior JR, Padilha MI, Lacey S, Pascon EA, Sousa-Neto MD. A comparative study of physicochemical properties of AH Plus and Epiphany root canal sealants. Int Endod J 2006;39:464-71. 21. Sousa CJ, Montes CR, Pascon EA, Loyola AM, Versiani MA. Comparison of the intraosseous biocompatibility of AH Plus, Endorez, and Epiphany root canal sealers. J Endod 2006;32:656-62. 22. Key JE, Rahemtulla FG, Eleazer PD. Cytotoxicity of a new root canal filling material on human gingival fibroblasts. J Endod 2006;32:756-8. 23. Schafer E, Olthoff G. Effect of three different sealers on the sealing ability of both thermafil obturators and cold laterally compacted Gutta-Percha. J Endod 2002;28:638-42. 24. Torabinejad M, UNG B, Kettering JD. Invitro bacterial penetration of coronally unsealed endodontically treated teeth. Part II, sealer types. J Endod 1990;13:109-12. 25. Onay EO, Ungor M, Orucoglu H. An in vitro evaluation of the apical sealing ability of a new resin-based root canal obturation system. J Endod 2006;32:976-8. 26. Leonard JE, Gutmann JL, Guo IY. Apical and coronal seal of roots obturated with a dentine bonding agent and resin. Int Endod J 1996;29:76-83. 27. 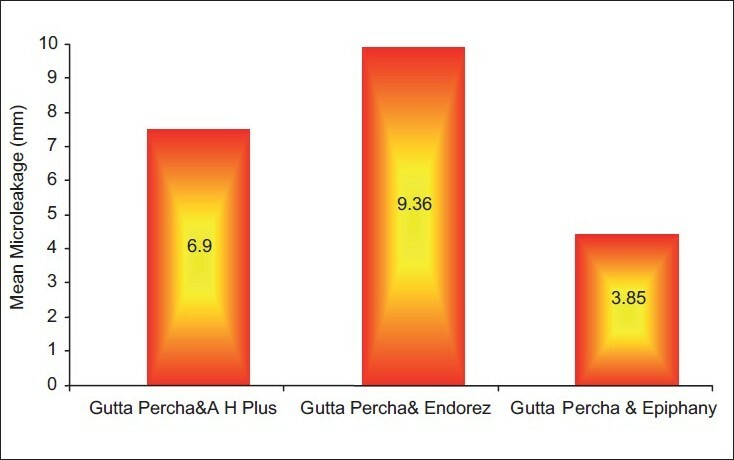 Ungor M, Onay EO, Orucoglu H. Push-out bond strengths: The Epiphany-Resilon endodontic obturation system compared with different pairings of Epiphany, Resilon, AH Plus and gutta-percha. Int Endod J 2006;39:643-7. 28. Orucoglu H, Sengun A, Yilmaz N. Apical leakage of resin based root canal sealers with a new computerized fluid filtration meter. J Endod 2005;31:886-90.